I love barley soup. Problem-I can’t eat it anymore because barley contains gluten and gluten is a no-go for me. So….I had been meaning to try out a replacement for barley. I have landed with oat groats! Oh my, why had I not done this before????! So warm, so satisfying, sooooo much like barley! 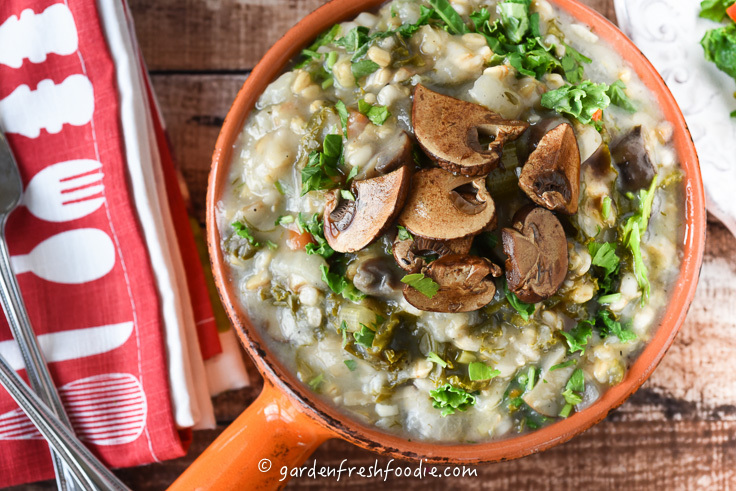 I did have a problem with the title of the soup-I just couldn’t call this Mushroom Oat Groat Soup. Totally doesn’t have the same ring to it. Right? 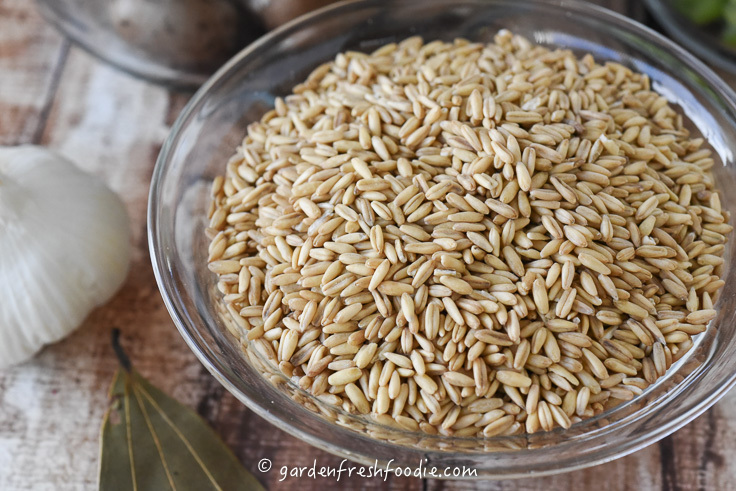 If you can eat barley, by all means, use it in place of the groats. Or-try something new and go grab a groat 🙂 It’s just fun to say. 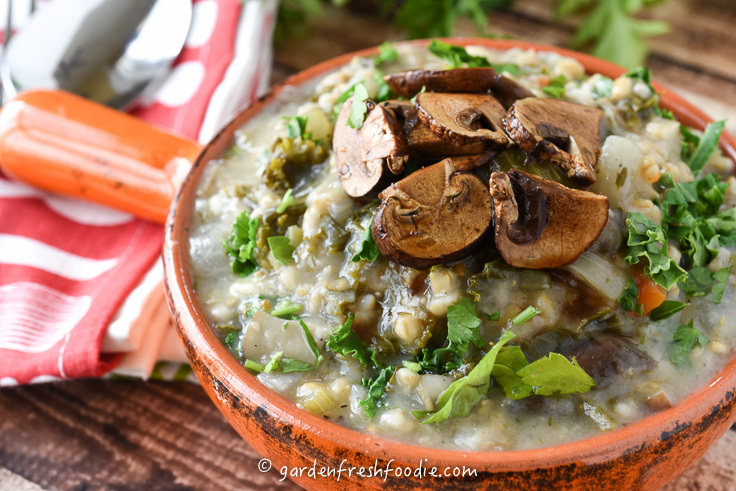 I topped my soup with some raw marinated mushrooms-yum! All you do is cut them up and pour a little balsamic on them. 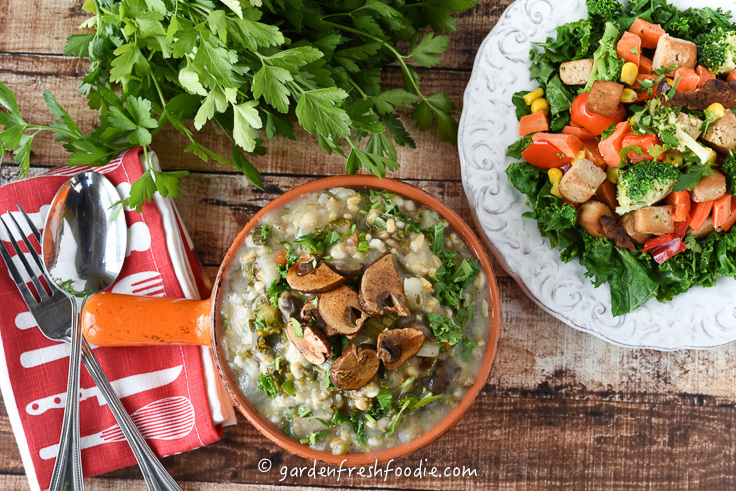 Let sit for a bit and you have…..marinated mushrooms! I know-it’s hard 😉 For any of you mushroom haters out there (maybe you aren’t even reading), simply omit the mushrooms and add in some extra veggies of choice. Good ideas: parsnips, rutabagas, or daikon radish. What’s a groat? A groat is the whole oat, minus only the inedible hull (or exterior). The whole kit and caboodle! If you’ve had steal cut oats, you’ve eaten groats. They’re just chopped up groats. When you eat rolled oats, the oat groat has been steamed and dried. Just like barley, the grains need to swell and soak in order for it to both be digested and for it to taste good. The hydration opens up the seed coat of the grain, letting liquid permeate it. This creates a chewy, meaty texture to the oat, different than if it had been streamed, rolled, and dried. Oats in this manner, since they’re less processed, are much higher in fiber. The oats will continue to absorb water as they sit, so the soup will become a thick, stew-like texture by the next day. Simply add additional water to bring it back to a soup like consistency, or eat it as is. Oats are packed with plant-based protein and their high fiber content helps to reduce blood sugar, cholesterol, and regulate the digestive system. 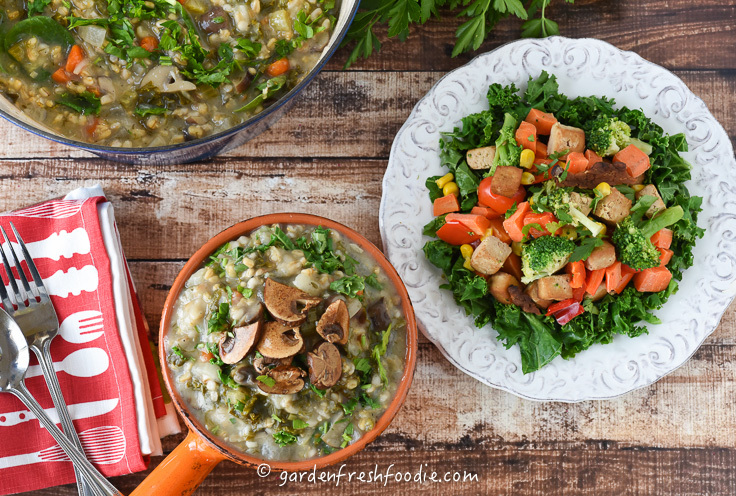 The added veggies in the soup boost the fiber content further. 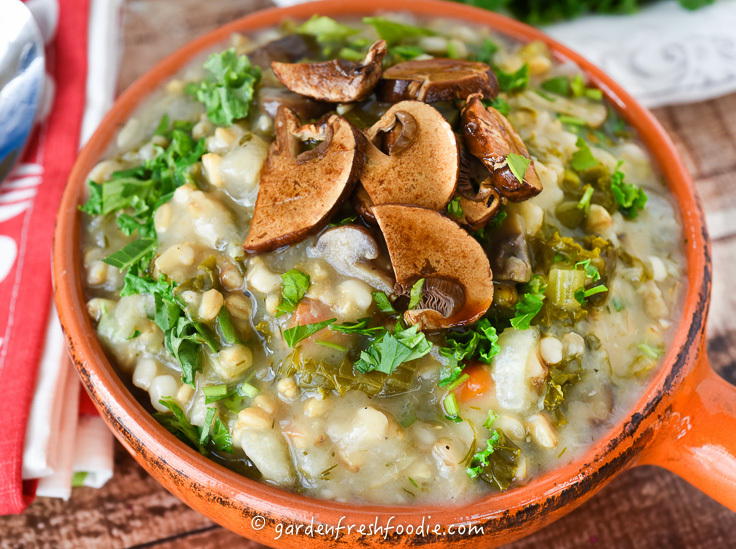 *I remade this soup and added red lentils. The lentils boost the protein, fiber, and magnesium in this soup, and create an even creamier taste. This soup, like all of my soups, was made oil free. I feel that using oil in soups and stews is an unnecessary use of calories. Simply sauté your veggies in a little water and you will accomplish the same softening effect as if you would have created with oil. By omitting the oil, you save 14 g of fat and 126 unneeded, empty calories per tablespoon. I always double my soup recipes, as I like to have soup/stew for leftovers and lunches all week. So-feel free to double, or triple. This, and all soups, freeze very well and are the perfect thing for a rushed weeknight meal (you will be so psyched to have fresh soup in the freezer)! Serve this with a salad and/or my Pumpkin Cranberry Bread! The kale salad below is topped pan-seared tofu from Veestro, a vegan food company I blog for. Saute’ onions, until translucent in a hot pot with a little additional water to prevent sticking (this step can be omitted and all ingredients tossed in at one time, with the exception of the greens). Add in groats/barley, lentils, herbs, salt/pepper, bay leaves, & water. Bring to a boil and reduce to simmer. Cook for about 1 hour. 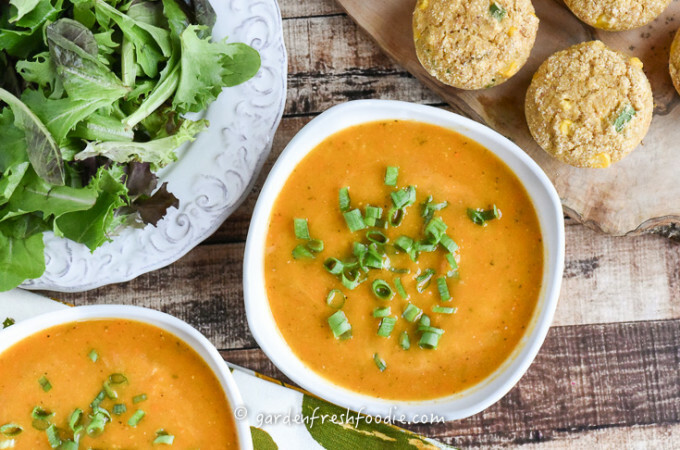 This soup goes so well with a fresh salad, or my Pumpkin Cranberry Bread!!! 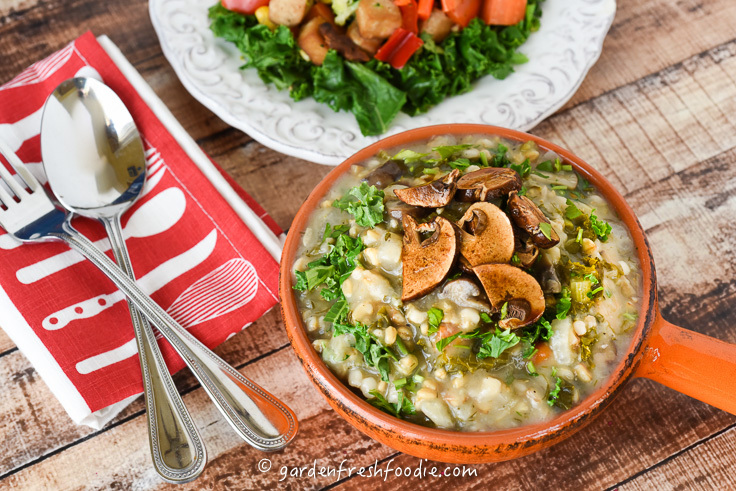 Mock Mushroom Barley Soup: made with oat groats instead of barley, this soup is gluten free and packed with cholesterol-lowering fiber! Saute' onions, until translucent in a hot pot with a little additional water to prevent sticking. Add in groats/barley, lentils, herbs,salt/pepper, bay leaves, & water. Bring to a boil and reduce to simmer. Cook for about 1 hour. Add in cabbage, and continue to cook until oats have completely swollen and are nice and chewy, about another ½-1 hour. Thanks for the heads up Dianne! Just fixed it. Let me know if you have any problems. Thx! Amy here from the Food Revolution Network. I’m the customer support manager. We’ve had several customers mention that the “or Barley” ingredient would render this recipe not gluten free. 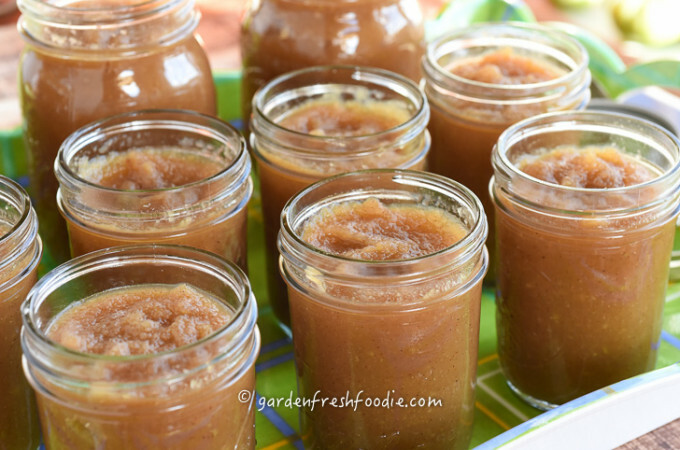 Is it possible for the barley ingredient to be removed from the recipe? HI Amy-the recipe you’re referencing has the word “mock” in it, because there is no barley in the recipe. I use oat groats in place of barley. Oat groats are gluten free. Where does the new addition of the lentils come into the cooking process? Thanks for the catch Vivian! I just updated the recipe. You add them in when adding in the groats 🙂 Enjoy! 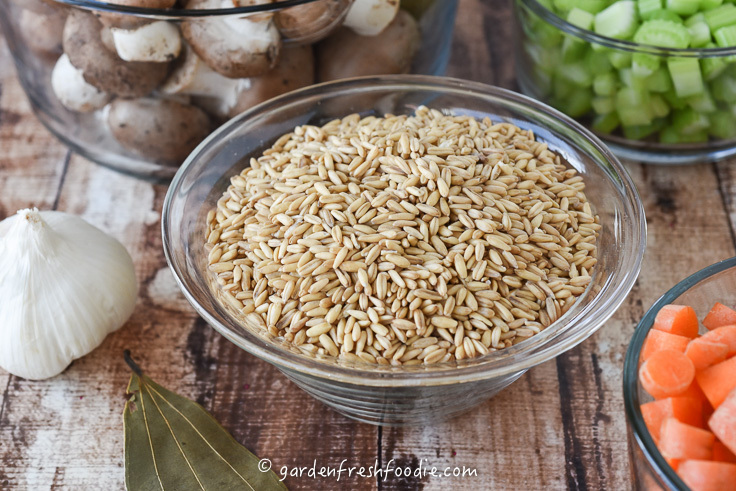 I bought the 10 minute barley by mistake – can I still use it and if so, when would I add to soup? Hi Jeana. You can make as directed and it just will take you a much shorter time. Note this recipe was made with oat groats. Barley isn’t gluten free in case you need it to be. Oat groats are (unless severe celiac). 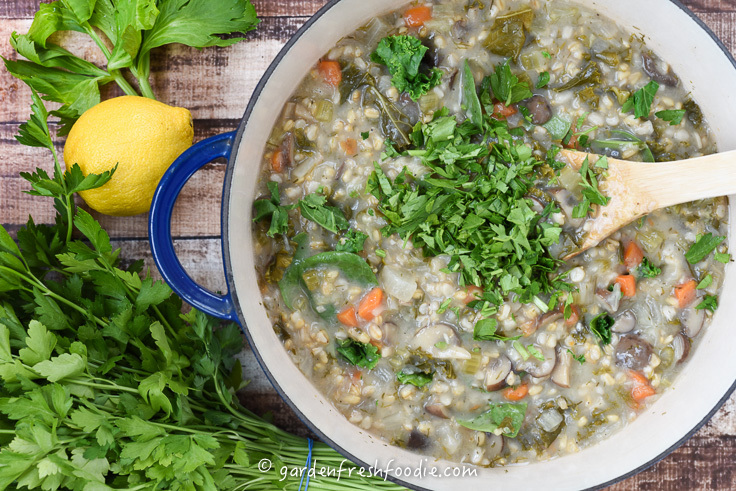 Thanks for your response – I made it and just added the 10 minute barley in the 2nd hour – turned out great! 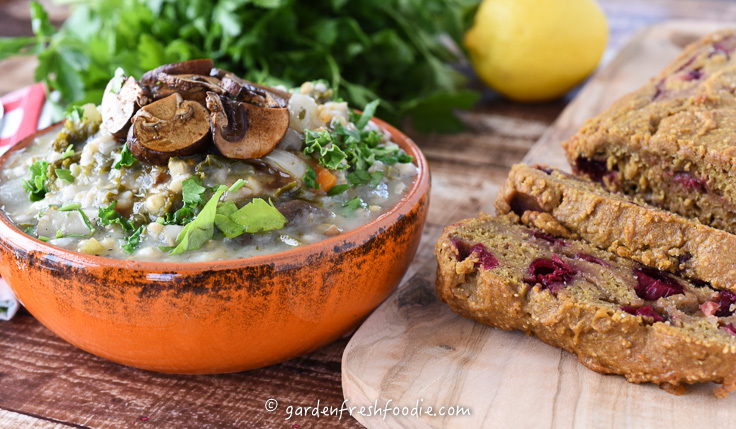 I’ve made it 3 times already with oat groats & red lentils and I absolutely love it. Was at Trader Joes today & they only had the 10 minute barley so that’s why I bought it – I can have gluten so no problem!! Best recipe ever! Awesome! 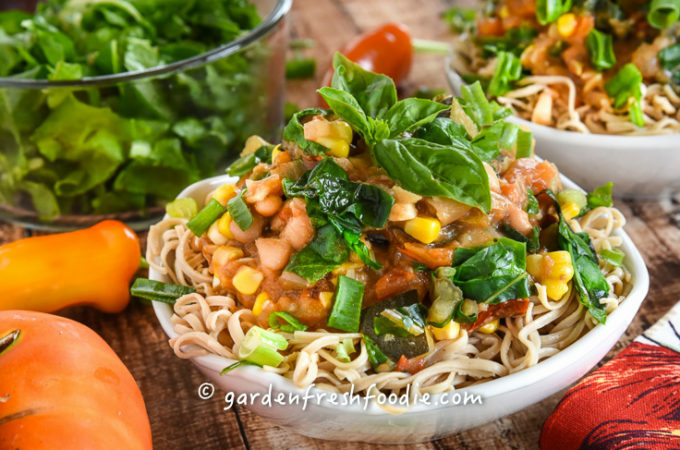 You don’t even have to cook it for more than 30-40 min with your changes!